Drywall sanding can be tedious and messy, but it is highly beneficial to getting that perfect paint application to make your home or place of business look beautiful. There are numerous different sanding tools that you can use to get the job done, and finding the best drywall sander will help cut down on the time spent sanding and, hopefully, on the overall hassle of the job overall. Drywall sanders come in either a manual or automatic form, and both have their pros and cons. A hand sander is certainly the cheapest option which may be a big consideration for the individual more concerned about saving money. An automatic sander requires a bit more of an investment (sometimes a lot a more), but is a much faster method to get the job done. And it won’t leave your arms tired! 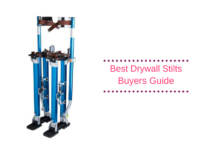 In the following guide, we will discuss what you should look for in the best drywall sander, and then offer a list of ten options for you to consider as you approach your DIY project. Keeping these factors in mind will help you make the best decision for your wallet and your drywall. As with any DIY or construction related project, you should first consider how large of a scale you are working on. 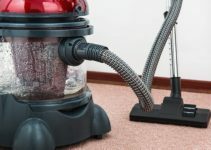 Are you looking to sand one room? Or are you looking at sanding a whole house? Is this a one time project? Or will you need tools for future projects, as well? The answers to each of these questions will help you determine which tools will work best for you. 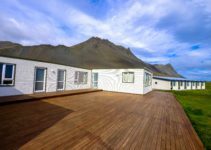 After all, you do not want to be stuck with a small sanding block to finish an entire three-story home just as much as you may not want to be stuck with a big bill for a high-tech sander when all you need it for is a single ceiling. Nearly all sanders come with the ability to adjust your grit size, but just in case, make sure that you choose the right size for the job at hand. A fine grit sandpaper is great for finishing touches or for the final smoothing of the drywall, while a coarser grit would work better for getting rid of pesky popcorn ceilings or other heavier duty jobs. Keep in mind what kinds of jobs within your overall project will need to get done to make the best choice. Drum Sander – This big guy is made for floor sanding, and is one of the most powerful sander styles out there. Belt Sander – With a continuously moving sanding belt, this aggressive sander is perfect for bigger jobs, though it comes in different sizes depending on your specific needs. Random Orbital Sander – This sander involves a circle of sandpaper and can be held with both hands. The rotation of the circular sandpaper pad can be controlled at various speeds, and is used to strip away unwanted material. Palm Sander – Similar to the orbital sander, the palm sander uses a square sandpaper pad that moves in a circular motion. This is a good tool for finishing work. 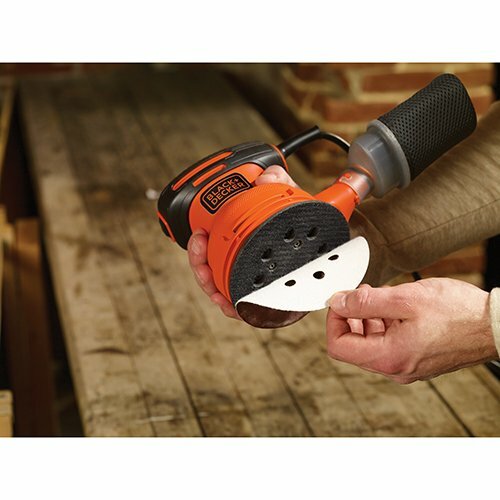 Detail Sander – This small tool works best in small spaces and for quick projects. Unlike many other automatic sanders, the detail sander does not offer any form of dust control. Sanding Block – This is the manual sanding block that is held in the palm and offers the absolute maximum in fine detail control. For drywall sanding, the best choice rests with the sander that is easy to carry and utilize across walls or ceilings. Depending on the scale of your project and the state of the drywall to be sanded, your sander needs may differ. Let us start with a classic hand sander. 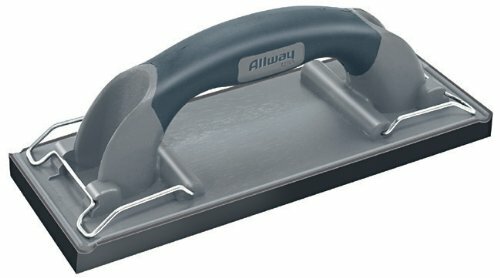 The Allway Hand Sander is constructed from heavy duty foam that can fit a half sheet of sandpaper that is secured with two stainless steel metal clips. The sander itself measures 9 x 3.5 x 3.2 inches and has a soft grip that makes your sanding job more comfortable. This hand tool is perfect for finishing and smaller detail work. Another hand sander, the Aouker HS85180 offers a comfortable sponge handle to reduce wear and tear on your hands during sanding and can fit one third of a sheet of sand paper (or approximately 9 x 3.6 inches). The sand paper can be attached to the tool via two large metal clips on either end of the sander. This is another perfect hand tool for finishing and smaller detail work. The ALEKO 690F electric drywall sander runs between 450 and 1050 RPMs and at an overall 520W, making it a powerfully useful sanding tool. The entire sander measures 50 inches or 70 inches with its handle attachment, making it easier to reach higher ceilings or other harder to reach places. 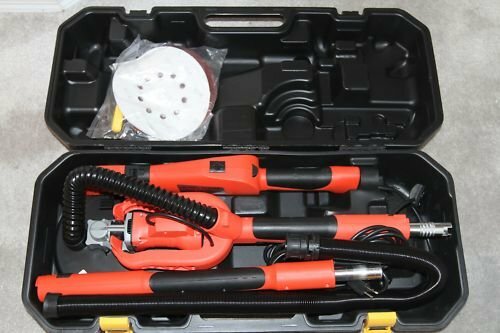 Each ALEKO 690F kit comes with the sander itself, six sanding discs, and a red case to keep everything secure when not in use. With 1.1 amps of power running at 1200 RPM, this sander is an efficient tool that is perfect for quickly and efficiently completing small detail and finishing work with less mess. The Tacklife PMS01A comes with a dust collection feature that will limit the amount of drywall powder left behind while you work. The sander measures in at 5.91 x 10.03 x 4.13 inches its angular sanding pad measures at 5 1/2 x 2 1/2 x 3 3/20 inches. 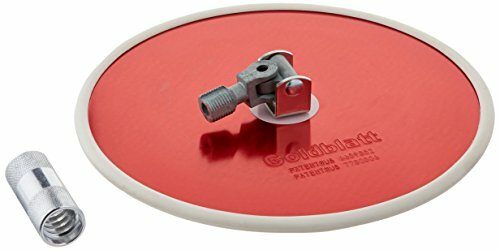 The Goldblatt G25638 Vortex Drywall Sander is a circular sanding pad that can be fit to nearly any length pole and comes with a pole adapter for more diversity in pole diameter. The free spinning head is covered with a protective rubber that prevents damage to the tool as well as to your walls. This sander is designed for optimal sanding around door jambs, window casings, and the edges of the ceiling (where the ceiling meets the wall). 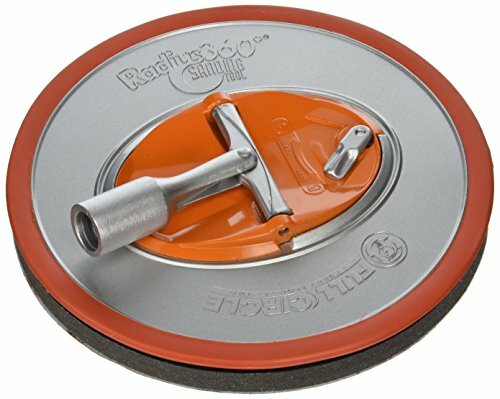 Its surface can fit any 9 inch hook and loop sanding disc. The disc measures at about 13.4 x 10.5 x 1.5 inches and does not come with any pole attachments. Another rounded sanding tool option, the Full Circle International sander offers 360 degree sanding with an attachment function that can fit either a hand or full-length pole for maximum flexibility. The head of the sander measures 9 inches and can be fitted with any 9 inch hook and look sanding discs. The tool itself measures 8.8 x 2.5 x 8.8 inches and comes with one sanding disc and a foam pad. 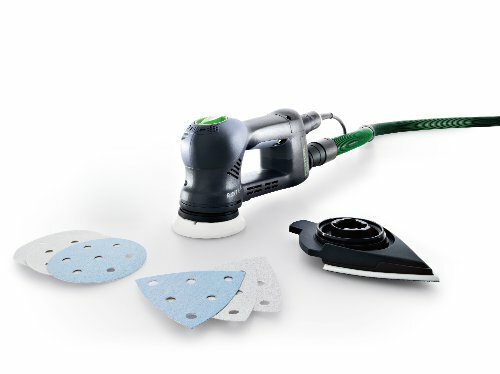 The Festool sander is a high-tech piece of machinery that allows for sanding both with round and delta-shaped sanding pads. There are several different speed options to give you the most amount of customization and flexibility for your sanding project. These options include a random orbital mode that is perfect for finishing touches. The sander is lightweight and measures at around 15.5 x 11.6 x 6.4 inches. The shining benefit of this sander is its high degree of adaptability, which means you get all of the sanding tools and functions that you could possibly need in a single device. The downside is that this device is much more expensive than similar products. 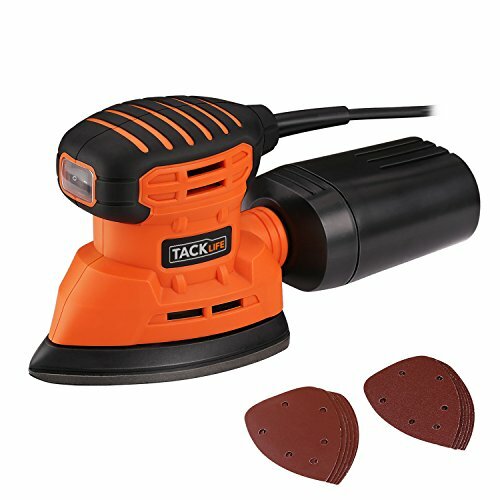 This Tacklife sander is of a random orbital sanding style that offers six different speeds which run at 350W and up to 13,000 RPMs. 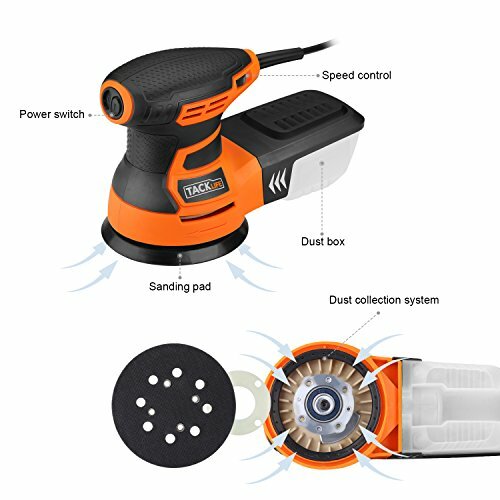 This is an exceptionally efficient and high powered device that is perfect for fast and powerful sanding. The sander comes with a built in dust collector, which will help reduce mess and time spent on your project. Constructed and distributed by one of the oldest names in hardware, the Black & Decker BDER0100 Random Orbit Sander is compact, measuring in at 7 x 5 x 6 inches. This sander also includes a dust sealed switch, which will keep the finer components of your tool protected from the wear and tear of dust and debris, thus giving it an extended life expectancy. 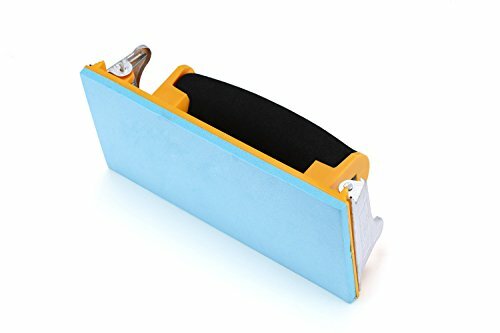 The 5 inch sander pad can be easily replaced via the tool’s efficient hook and loop system, which will cut down on needless time wasting during your sanding project. This convenient, powerful tool is also highly affordable and will last you for years to come. This small sander comes with quite the punch: a 0.28 horsepower motor that can reach up to 12,000 RPMs while in use. 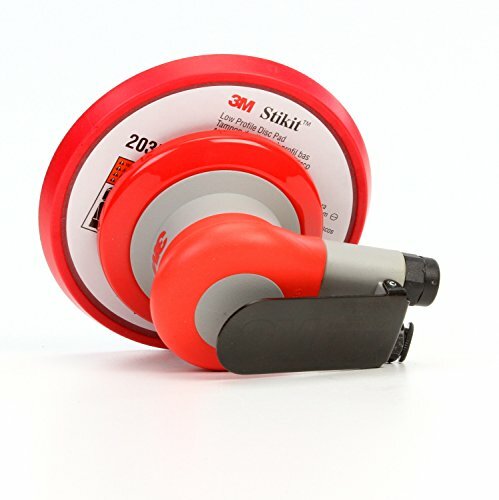 3M has not wasted any time crafting a powerful random orbital sander that is less expensive than other models like it. The sander uses a 6 inch sanding pad that is easy to replace.